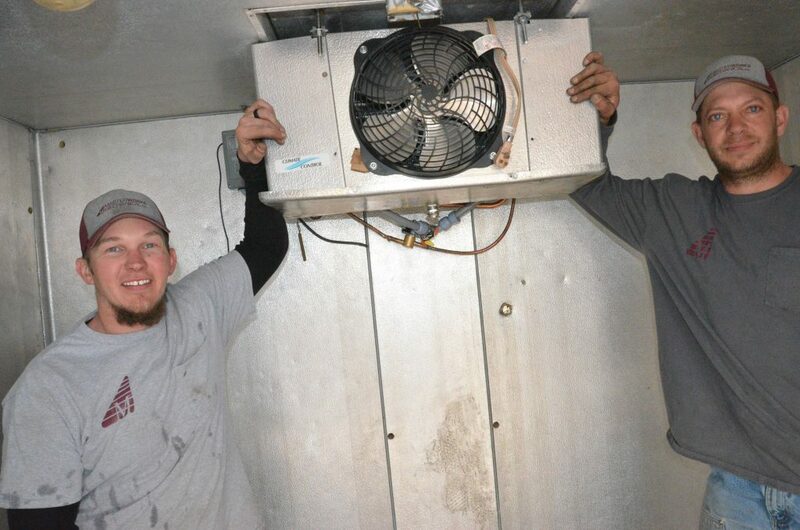 Andre Cech, left, and Wade Webber, with Masterworks Mechanical, take a break from assembling a walk-in refrigeration unit for St. Michael's Community Kitchen. The organization has provided food storage for St. Michael’s Catholic Church since the community kitchen began, with the unit of The Memorial Hospital’s former site on Russell Street. However, organizers arranged for the unit to be relocated to the church’s property as MRH continues to undergo changes. “The hospital has been so generous to us over the years,” said community kitchen organizer Robin Schiffbauer. “We are so thankful for all they’ve done. Schiffbauer noted MRH also arranged for a new compressor for the the walk-in refrigeration unit, which will now stand adjacent to the church’s main building. Schiffbauer said Greg Knez poured the concrete for a small spot next to the church parking lot, about the size of a storage shed, while Masterworks Mechanical re-assembled the unit and will be hooking it up to an electrical source. “It was kind of like one big jigsaw puzzle, just trying to get all the pieces lined up,” said Masterworks’ Andre Cech, who was hard at work April 5 with colleague Wade Webber getting the structure put together. St. Michael’s will be the primary user of the unit, though Schiffbauer said it will have space for fellow programs such as Interfaith Food Bank or Love INC of the Yampa Valley, if they need it. “It’ll be really great for all of us,” she said. For more information on St. Michael’s Community Kitchen, call 970-824-5330.